FREE FedEx 2-Day Shipping! (over $49.) FREE Gorgeous Gift Wrapping, Polishing Cloth, Keepsake Pouch, & Certificate of Authenticity. As with all luxury brands, there are many imitations made to look like the Tiny Blessings brand. Our profound commitment to high quality is unparalleled, using only the finest and purest gems, gold and silver, all while upholding vigorous safety standards. 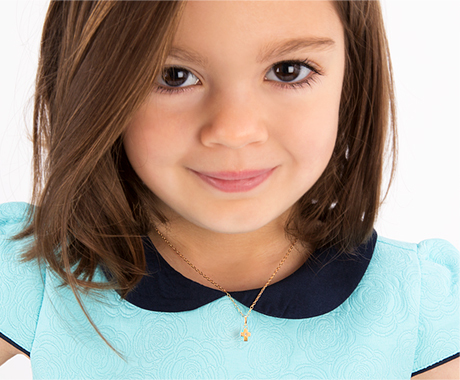 Our passion and vision for meaningful, heart-felt keepsake gifts for your little ones has allowed Tiny Blessings to become the most trusted designer of children's jewelry for nearly two decades. Original jewelry designs copyrighted by R. Vicenzi. We are a full service jeweler, we have been in the business for over a decade and plan to be here for decades longer. © 2015 TinyBlessings.com. All Rights Reserved.